Our product range includes a wide range of red onion flakes. 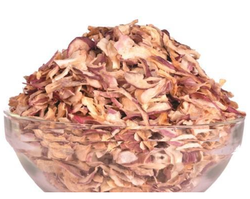 Dehydrated red onion/ Flakes / kibbled, the product is prepared from sound, mature onions, which have been properly washed, peeled, topped and tailed cut into desired cut size. After dehydration the product is sorted, sieved and graded.